I’ve spent a number of days recently in a couple of schools where I’ve been working with school leaders and staff for an extended period of time now, assisting them with their strategic visioning and planning, and in coaching and mentoring staff leading their in-school professional learning programmes. I find this highly satisfying and rewarding work – and it reminds me of just how complex the setting of a school is, and how important it can be to have a variety of perspectives included in the process of designing and implementing an effective PLD programme that will (a) help a school achieve it’s strategic goals, (b) enable individual teachers to develop and grow professionally, and (c) contribute to raising student achievement as the ‘end game’. New Zealand schools are currently coming to terms with what the new environment for professional learning means for them. The Communities of Learning | Kāhui Ako that they are being encouraged to form are described as a group of education and training providers working together to help learners achieve their full potential. The significant difference here is that previously the agenda for government funded Professional Learning was determined by the Ministry of Education in order to meet their objectives – where now the onus is on schools and Kāhui Ako to take on this responsibility – and then proceed to find the approach that will best suit them to achieve this. As someone who has spent much of the past two decades working alongside schools and teachers I am very interested in the approaches being taken (and in some cases not being taken) to engage with external expertise as a part of this process. In the Best Evidence Synthesis, Helen Timperley et al. (2007) emphasise the role of external expertise, which they say can assist in creating more challenging dialogue across a group. They found that “all studies of professional communities that did not lead to improved outcomes for students lacked external input. In these studies, challenges to assumptions held by community members typically did not happen” (p.203)**. 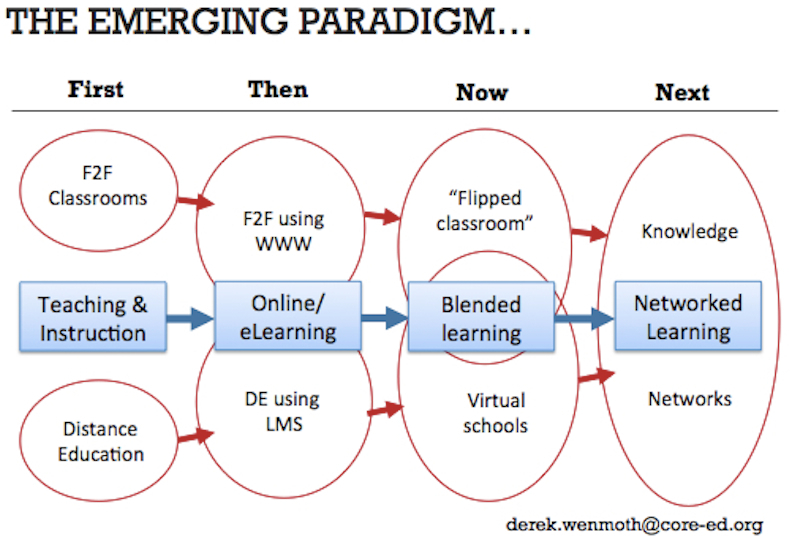 So it was with interest today that I came cross a report titled The State of Educators’ Professional Learning in Canada (pdf) from LearningForward, which provides a useful overview of the experience in Canada – across the diverse approaches taken across the ten states and three provinces – of the provision of professional learning in schools. Overall, the study findings indicate that valuing, respecting, and promoting a range of professionals’ and students’ outcomes is important in Canada. Student achievement matters; however, outcomes are not only about test scores. Generally, professional learning content needs to develop teachers’ efficacy, knowledge, and practices in order to support students’ efficacy, engagement, learning, and equity of outcomes. In relation to my point above regarding the role of external vs internal expertise (and direction setting etc.) the Canadian report concludes.. Overall, the findings indicate that system- and school-directed professional development can be important to support current priorities; however, such development also needs to be balanced with flexibility for teachers and other educators to identify specific professional learning needs for themselves linked to their students, schools, and contexts. Opportunities for teachers to lead their own learning, and that of their colleagues, can benefit individual and collective professional learning and support changes in practices to benefit students’ learning. This finding should offer some encouragement (and direction) for New Zealand schools who now have the mandate to operate with similar agency as they identify specific professional learning needs for themselves linked to their students, schools, clusters and contexts. **Timperley, H., Wilson, A., Barrar, H., and Fung, I. (2007). Teacher Professional Learning and Development: Best Evidence Synthesis Iteration (BES). Wellington: Ministry of Education. The start of the school year in NZ is not far away now and I’ve been gearing up for a number of teacher only days with schools in various parts of the country. As part of my preparation I’ve been talking with some of the principals and senior staff in these schools to determine exactly how my contribution will assist them in achieving the goals they have set for staff etc. A common theme that is raised in these conversations concerns how well (or not) teachers are being prepared for their work in schools the approaches taken to initial teacher education in many of our pre-service providers. A critical concern is around the perceived gap between theory and practice, and what appears to be the limited amount of time pre-service candidates spend in classrooms practicing and refining the things they have learned in the lecture halls and classrooms of their initial teacher ed provider. It’s an age-old debate – one that was certainly alive and well when I was a lecturer in one of these institutions, and that was before the amalgamations with Universities had even occurred. And it’s not simply the domain of education in focus here – we’ve seen similar developments in health, with nurses being trained in primarily in tertiary institutions and less on the ground in hospitals for instance. It always seems to polarise opinion. Advocates for greater amounts of time in classroom-based experience argue that it ensures candidates are more ‘classroom ready’ when they graduate, particularly when it comes to aspects of behaviour and classroom management. Those advocating for more theory argue that building such a base of knowledge better prepares students for the diversity of experiences they may encounter in their career. A sub-argument in this group is the fact that it’s often cheaper and less resource intensive to cater for larger groups in a lecture-style environment. I am personally disposed toward a practice-based approach. Just a few years ago I had the privilege of being part of the team that designed and developed a new pre-service teacher education programme for the Eastern Institute of Technology. This three-year Bachelor of Teaching qualification is a practice-based teacher education programme providing a balance between theory, research and practice. The practice-based approach involves the candidate teachers working alongside experienced teachers in local primary and intermediate schools for two days a week as part of the programme. The other days in the week are spent on campus exploring the research and theoretical aspects of curriculum and pedagogy etc. A point to be made here is that practice-based approaches are about much more than simply finding a place for candidate teachers to spend time observing and then mimicking what they see being modelled by their host teachers. An argument against practice-based approaches is that they can simply result in a ‘replication’ model of classroom practice – where bad habits and poor teaching strategies are perpetuated. Practice-based approaches will only work where both the candidate teachers and the host teachers are working together to resolve the issues and concerns they face in the classroom on a daily basis, drawing from experience, evidence and research as they do so. The strength of the EIT programme is that it is a true partnership between the candidate teachers, EIT as the provider organisation and the schools which provide much more than simply a place for the candidate teachers to ‘practice’. Modelling is how teacher educators provide candidates examples of what expert performance looks like in practice. Spaced learning opportunities are those that offer candidates opportunities to practice the knowledge and skills acquired in coursework over a period of time, that are sustained and repeated, and that are scaffolded to deepen candidate expertise. Varied learning opportunities are those that provide candidates with opportunities to practice the knowledge and skills they learned in their coursework across varying contexts, with a diverse range of student learners, and with differing degrees of support. Coaching and feedback opportunities are those in which supervisors provide explicit coaching and constructive feedback as candidates practice the knowledge and skills they acquired in their coursework. The focus of the coaching and feedback is on improving candidates’ practice and expertise. Analyzing and reflecting opportunities are those in which candidates practice the knowledge and skills they acquired in their coursework while engaging in analysis and reflection upon both their practice and their impact on student learning. Scaffolded practice-based opportunities are those in which candidates apply the knowledge and skills they acquired through their coursework, within teaching experiences that gradually increase in complexity over time with fading support from teacher educators to promote deeper learning of content, improved instructional implementation, and, ultimately, autonomous performance. Arguably, these same features could (or should) just as easily characterise effective in-service professional learning. The point is that the relationship between pre-service and in-service teacher education so often focuses on what makes them different, rather than what makes them the same or similar. If we are truly committed to principles of life-long learning, teaching as inquiry and responsive practice, then we need to be thinking more of developing an approach to professional learning that is more collegial, more collaborative and more inquiry-focused – where the openness to changing practice in light of evidence is the norm. So let’s stop the rhetoric that ‘blames’ others for the perceived failure to adequately prepare for or grow within the profession and let’s start 2017 with a commitment to working together to find new ways of addressing the issues and concerns in our classrooms, schools and clusters, using methodologies and approaches that draw upon the vast pool of experience, research and evidence that exists in our midst. December 5-11 is Computer Science Education Week, and everywhere I go there seems to be all sorts of activity going on with children in schools learning to code and use computers in interesting ways. One of the initiatives that seems to have taken off this year is Hour of Code™, and as part of this initiative the organisation I work for, CORE Education, has worked with with Microsoft, OMG Tech! and High Tech Youth support this by assisting with the development of a new Minecraft tutorial, which was developed in close partnership with Code.org. The tutorial includes Minecraft characters and Minecraft-inspired challenges that will be familiar to the expansive Minecraft community, while still being approachable to newcomers interested in learning the basics of coding and game design. The new Minecraft tutorial is for students ages 6 to 106—anyone can learn to code! Our Māori team at CORE have contributed to this effort by ensuring new Minecraft tutorial is available in Te Reo Māori. This now makes this significant resource available to students in the many Māori Medium schools we have in New Zealand. Why code? In a society continually transformed by technology, the problem-solving and critical-thinking skills gained through computer science education provide the essential tools needed to innovate, pursue in-demand jobs, and understand the world. All young people should have the opportunity to learn the skills needed to fulfil their passions. It’s easy to sign up your school or class to run an Hour of Code programme – with everything you will need to lead your own Minecraft Hour of Code, including a facilitator’s guide, quick tip sheet, and PowerPoint slides. These materials are available for you here. I’ve spent some of the time over the past few days preparing for two conferences that are coming up next week – the first being the NPDL Southern Deep Learning Lab in Christchurch, and the second being the huge ULearn conference – being held this year in Rotorua and expecting nearly 2000 educators from all over New Zealand. Each event provides an opportunity for educators to delve more deeply into the things they’re interested in and to be exposed to a wide range of new ideas and new thinking that they can translate back into their context. As I look through the abstracts and programme for ULearn this year, I am heartened to see a distinct change in the themes and topics that are the focus of the three days. Alongside the usual array of workshops sharing new ideas for using technology in the classroom, there is a more significant focus on the ‘bigger picture’ issues impacting our education system – consistent with the themes of the conference , and the focus on Transformation that is common across this year’s keynote speakers. Seems to me that now, more than ever before, we need to create room in our busy lives to take time for this sort of thinking, as now more than ever before, we’re facing times of exponential change in all facets of our lives – including education! In these exponential time we are faced with a number of wicked problems that will require much thought, consultation and innovation. They cannot be solved by the simple stroke of a politician’s pen to implement some new strategy, neither will the be solved by learning about some new app that one can install on a tablet to assist with reading. As part of my preparation for the conference I’ve been reviewing a number of the ‘big ideas’ that are impacting education at present – and pondering these in light of the various political agendas that seem to be driving change at present. One of the things that set me thinking along these lines was the release of the draft report from the Productivity Commission on New Models of Tertiary Education (PDF). Not surprisingly the draft report has drawn immediate reaction from a wide range of people – including politicians, universities, tertiary teacher unions etc. as it makes some very bold recommendations for what might happen in our tertiary sector. Need to agree on the purpose of education – focus on developing personal skills to live an enriched life, but includes public benefits too: a stronger civic society. Students are disempowered in the system – there needs to be a strong focus on placing students at the heart of the system, recognising the agency of learners, and the need to meet the needs of all learners, from diverse backgrounds and with diverse goals. High levels of regulation and compliance have the effect of perpetuating traditional approaches to tertiary education. Providers are more responsive to the government than to students. While some teachers and providers innovate, core business models have persisted i.e. there isn’t evidence of innovation at a system level. Inertia is an emergent property of the system – and government control is pervasive. Quality is a concern – the system appropriately seeks to ensure minimum standards are met, but overall the system lacks a mechanism for rewarding quality or responsiveness to students. The system is educating fewer students over time and continues to serve some population groups poorly. allowing more providers into the market – including those providing for international qualifications and those with different approaches such as MOOCs etc. Whether or how these recommendations are acted on will depend on the feedback in the next round of consultation – what we can be more certain of, however, is that the rate and pace of exponential change will continue to impact on us, demanding that changes are made to our system – and these must be transformational in nature, not simply incremental. The video at the top of this post is a salient reminder of the types of issues we face – not because it is necessarily an accurate prediction of what the future may hold, but because of the way it captures and illustrates the potential futures that may emerge based on the actual present and recent past events that are a part of this exponential change in society. There are a lot of important indicators embedded in this video that are consistent with the messages coming through the Productivity Commission’s report, and as educators we will do well to deeply engage in the debates and issues – not devote all of our energy to the superficial themes that are distributed by the ‘sound bite’ journalists in the media. The salient point of this video comes right at the end where the narrator attempts to conclude that there are two possible directions the future may take. The predictions are concerning at the very least, and verging on apocolyptic at worst – but serve to illustrate the point I am trying to make, that in the times ahead, the times that will define the future for the kids in our schools, for our own kids and grandkids, the challenges we face will be wicked problems (problems that are difficult or impossible to solve because of incomplete, contradictory, and changing requirements that are often difficult to recognise) and to address them will require that we all are proficient in the skills of critical thinking/problem-solving, creativity, communication, and collaboration, and that we demonstrate the character qualities of curiosity, initiative, persistence/grit, adaptability, leadership, social and cultural awareness. The fact is that we’ve needed to steer this course for some time now – but the fact is that our pace of change is being outstripped by the pace of change in the world in which we live and in the lives of our students! As we make our way to the various conferences and events we have lined up over this student break, let’s be prepared to raise the level of our thinking and allow ourselves to be challenged, made uncomfortable and to engage deeply in the issues that we most urgently need to address. Or, as the move above warns, we will by default subject ourselves to the decisions of ‘the leader’ (whoever or whatever that may mean!). Let’s face it – schools are primarily about kids and their learning. Sure, we need buildings, teachers, furniture, timetables and the like to support that, but the primary focus should be on them. This is why I am personally very pleased to see the recent announcement from the Ministry of Education regarding the Education (Update) Amendment Bill. The current Act under which our education system operates places huge emphasis on the structures and governance of our schools, but less on the kids themselves – in fact learners and learning are barely mentioned. This would work well enough if all of our learners were uniform in terms of their learning needs and they were all happy to take whatever courses their local school can provide – but that’s no longer the case. The world has become an increasingly diverse place, creating increasingly diverse opportunities – and demands – for our young people. As a result, their expectations (and those of their parents and whānau) have changed – and many parts of our current education system are struggling to address this. The proposed changes to the Education Act will provide greater flexibility for the system to respond to these expectations – now and into the future. As with any change it will be necessary to discuss and debate the detail in order to ensure there are no ‘unintended consequences’ – and I welcome that as part of a participatory democracy, as long as we can move beyond the ‘sound-bite’ journalism we are subjected to from the media and politicians. One part of the proposed Amendment that appears to have drawn lots of attention already is the proposal to enable new partnerships between schools and online learning providers, and enable children and young people to access their education through online delivery. It is proposed that online learning providers will come from the schooling, tertiary education, and private sectors, and will be able to seek accreditation as a Community of Online Learning (COOL). Much of the discussion has immediately focused on suspicions around the entry of private providers into the education system (as if that hasn’t happened for decades already). The debate around corporate support of Education is crucial to the continuation of a public education system that is free and available to all and I support that. But within the rigors of this debate let’s not confuse the issues. If the concern rests with corporate participation, then let the debate focus on that –but let’s not pour scorn on the opportunities that are being created for learners to have their learning needs meet in ways that may be more creative, more flexible and more relevant to their needs, culture and interests. It’s good to see that the first COOL off the block will be Te Aho o Te Kura Pounamu (Te Kura) – formerly the Correspondence School. This institution has been operating since 1922, catering for the needs of students who don’t “fit” the conventional education system – some because of isolation, some because of circumstance, and a good many because the areas of study they wish to pursue aren’t available to them in their local school – and so they become ‘dual enrolled’. What’s perhaps not as well known is that until now, Te Kura has operated under it’s own section of the Act, especially crafted to suit the way Te Kura operates as the provisions of the Act that applies to all other schools don’t work for it – for instance, the requirements around attendance, opening hours, staff contact etc. As someone who used to work at this institution, I am very pleased to see that they will now be able to operate with greater flexibility and in a more coherent way with their site-based counterparts, particularly as around 50% of their over 20,000 students are already based in these schools. The fact is that for over 90 years, Te Kura has been serving the education needs of a segment of our population who would otherwise have been denied the opportunity within the structure of site-based schools – and to my knowledge, they have done this as successfully as any other school. Many of our business leaders, politicians and even Prime Ministers have benefited from an education that has included time enrolled with the Correspondence School. Learning at a distance in this way has always been about a choice for some, and the only viable option for others – either way, the quality of provision has ensured success for those participating as learners. The prospect of this ‘distance’ engagement moving into an online environment brings with it even more opportunity, as well as issues to be addressed (i.e. equity, access, support etc. ), but is nonetheless a welcome move in my view. And it’s not new! Te Kura have been using online technologies to engage with their students for over a decade, and around New Zealand, teachers in many of our remote and rural schools have been using online technologies to create opportunities for their students to access subjects of their choice for almost two decades. What these schools have in common is that in the interests of serving the needs of their students they have had to struggle with and become creative about the way they operate within the limitations of the current Act. Being unable to recognize students being enrolled with more than one school, or requiring a teacher to be a staff member at a specific school while their expertise may be spread among many are a couple of examples – along with the whole financial side of things which means money allocated to a student can only go to one school with no easy way of sharing that when that student may be accessing her or his learning from one or more other places. The changes proposed in the Act will, hopefully, allow a more equitable and fair way for these schools and teachers to operate within. The important thing about these examples is that they aren’t about a “one-size-fits-all” approach. No-one is suggesting that learners spend the whole day in front of a computer, devoid of any social connection. Educational research strongly supports the fact that the role of schools in supporting children’s social and emotional development is just as crucial as their cognitive development. I’d argue that by creating the opportunities for learners to access the subjects they want from while still attending their local school gives them the best of both worlds. There are several schools in the Virtual Learning Network (VLN) that are now thriving because they have been able to retain their learners in the local community where their social and emotional needs can be nurtured and cared for, while also ensuring their academic potential is realized by providing access to high quality instruction in subjects of their choosing using online technologies. This is not to mention also the opportunity created for many of these teachers to grow and develop professionally while remaining as teachers in these rural settings. This isn’t something only for rural schools – the opportunities apply equally in urban settings. While I was working at the (then) Correspondence School our records showed only two secondary schools in New Zealand that didn’t have students enrolled for distance education – which suggests that even in our urban schools, the limitations created by factors timetables and staffing availability mean that even there students’ needs can’t be fully met under the current structure. A good example for me arose in Christchurch following the earthquakes there where one secondary school that was (and still is) re-located as a result of damage joined the VLN to ensure its students could have access to a broad curriculum. Their roll stabilized, their community remains intact and they remain a part of the VLN today. I am pleased to see that due attention is to be given to the accreditation and regulation of any COOL providers – as should be the case, and is with our current schools. According to the information released this week, COOL will have to meet criteria relating to their capability and capacity to deliver education to students in an online environment and some COOL will be subject to additional terms and conditions, like which students they can enrol. All COOL will be subject to a robust quality assurance regime, including requirements to meet specified student outcomes. 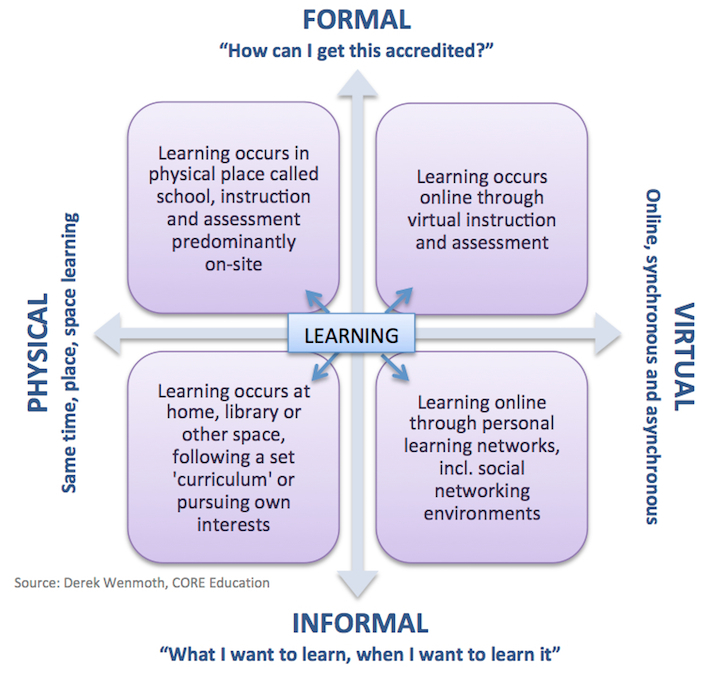 This is both good and necessary because, as has been reported this week, alongside the very successful models, there are some rather awful examples of attempts to introduce online learning into schools – particularly some of the US online charter schools. This is where the voice of informed educational and community leaders needs to be heard, and involved in the process of accreditation. Staff in organisations such as Te Kura, the VLN Community and the Flexible Learning Association of NZ (FLANZ) are all part of an established body of education professionals within our country who have been doing this sort of thing for many years now – they should be consulted to ensure the policy and implementation models are informed by experience and research evidence. So let’s keep the discussions going, and tease out where the opportunities are, and where the potential risks and downfalls are. But let’s also focus our attention on what this is all really about – our kids, their future and how we can work together to ensure we create a system that is fully supportive of addressing that. My post today is to acknowledge the passing of a truly inspirational leader in the field of educational technology – Professor Emeritus Seymour Papert, who died on Sunday aged 88. He was an educational-technology visionary and a founding faculty member of the MIT Media Lab. Papert was among the first to recognize the revolutionary potential of computers in education. In the late 1960s, at a time when computers still cost hundreds of thousands of dollars, Papert came up with the idea for Logo, the first programming language for children. I used this with my students to program the movements of a “turtle” around the screen, learning as they did so some of the essentials of programming. Despite the fact that we’ve seen generations of change in the form and nature of technology that we’re using in classrooms, I find this to be as true a statement today as it was when it was written, and it continues to influence the way I think about how we integrate and use technology in education. Papert has influenced a generation of educators such as myself, and the legacy of his work will continue to influence generations more I’m sure. In a previous post I described a new era of professional development, outlining four key principles drawn from both research and experience in this area. I reflected further on that today as I read a report from leading Australian researcher Ben Jensen, titled Beyond PD: Teacher Professional Learning in High-Performing Systems in which he analyzes the way four high-performing education systems provide professional learning to their teachers. Across all four high-performing systems analyzed—British Columbia (Canada), Hong Kong, Shanghai (China) and Singapore — professional learning is central to teachers’ jobs. It is not an “add on,” something done on Monday afternoons or on a few days at the end of the school term. Teacher professional learning is how they all improve student learning; it is how they improve schools; and it is how they are evaluated in their jobs. While these systems are quite different, the key to all of them is that collaborative professional learning (teachers working with other teachers to improve curriculum, instruction, school climate, etc.) is built into the daily lives of teachers and school leaders. Enable teachers and school leaders to share responsibility for their own professional learning and that of their peers. These points align with the rationale promoted by the New Zealand Ministry of Education in its current policy initiative, Investing in Education Success (IES). According to the IES policy, schools will receive additional funding to release other teachers to spend time on the job, continuing to develop their professional skills for the benefit of students in their own classrooms. Specifically,the IES policy promotes a greater emphasis on Inquiry Time, providing more time for teachers to focus specifically on working together to tackle achievement challenges. The proof will be in the pudding, of course, as to how effective the drivers that are being used to implement this policy are in terms of promoting the desired shifts in behaviour at a school and system level. well developed frameworks and models exist and are used for evaluating the effectiveness of the process – including the impact on student learning and achievement. We stand on the brink of a radical change in the way PD is 'done' in NZ schools – my hope is that those who are leading the approach within the different schools and clusters (and nationally) take the opportunity to delve deeply into the theory and practice of professional development, and ensure the strategies they adopt and promote meet the standards of what the research has been informing us about over the past decade or so. There’s an old saying, “There’s nothing more certain than change”, and this will certainly be true as educators in NZ prepare to return to work in 2016. Whether we’re re-thinking what we teach, how we teach, where we teach and even who we teach, dealing with the demands of change is the biggest challenge facing schools, kura, and centres today. Establishment of communities of schools/learning and the new principal and teacher roles associated with that. Using internal evaluation to lift student achievement. New forms of assessment — including digital assessment at NCEA level. Outcomes from the review of the Education Act. Establishment of the Education Council and their emergent role in guiding teacher appraisal and educational leadership development. Introduction of a Digital Fluency requirement in our curriculum. Changes in the way PD is provided as a result of the PLD review. Aligning with the MoE’s draft vision for 2025 of Lifelong Learners in a Connected World. Application of the school evaluation indicators from ERO. 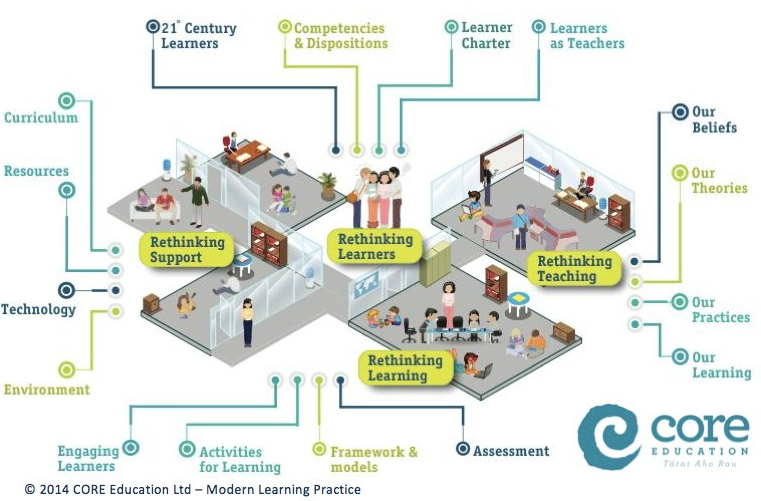 Development of Innovative Learning Environments (ILEs) in many areas. New health and safety requirements for schools and centres. These are just a selection of the drivers at a national level for 2016 — in addition, there will be all sorts of drivers at a regional and local level that may need to be considered. Change confronts and challenges our ability to address the needs of our learners in a productive and relevant manner — at both a personal and system level. While many of these changes may not appear to be immediately relevant to the teaching and learning that occurs in individual learning environments, collectively they point to some significant changes for our schools, kura and centres, and for our system as a whole. As such, there will inevitably be an impact on the work of individual teachers and the work they do with their learners. It is imperative that educational leaders understand how to engage their staff, and lead their school/kura/centre (or cluster), in collaborating around change. Don’t be afraid to draw upon the advice and guidance of external expertise where this will help — engaging a critical friend at this stage can save a lot of angst as the year gets under way. When it comes to effectively managing change 'nobody's as smart as everybody' because schools/kura/centres/clusters must consistently identify and resolve critical change issues, innovate the way they work, and find new and different ways to grow. Is our school/kura/centre/cluster aligned around its educative purpose? Does this clearly identify the learner at the centre? Are we guided by a clear vision for the organisation, for our students? Whose vision is it? Has this process involved genuine consultation with the community — including local iwi? Do we have a set of collaboratively developed and owned values that guide how we work? Have we clearly identified the challenges that we must address — and why? Are the responses to the questions above clearly articulated to the staff, BoT, and community in an action plan with well-defined goals and outcomes that can be measured? If the questions above can be answered affirmatively, then your school/kura/centre/cluster is well positioned to move to the next stage of designing and implementing a change management programme. Of course, managing change in any educational setting isn't as simple as implementing some seductively attractive turnkey change management model. This is because educational change isn’t primarily about introducing new systems, facilities, or resources — it’s about changing people. It’s about changing hearts and minds, and about ensuring that everyone has the opportunity to participate in the change process, and not feel that it is being ‘done’ to them. Professional development in collaborative groups is needed to understand and collectively build the trust, shared values and beliefs, shared purpose, shared goals, and shared responsibility. Along the way there will be provision for meeting individual needs, ensuring that individual staff are provided with the support and resources required to prepare them personally for the change. However, achieving whole-school/kura/centre change requires everyone to be committed to the same change goals. Ultimately, these change goals must reflect a concern for the learners, with every learner achieving to the very best of his or her ability. An effective professional development programme must offer more than a sequence of ‘one off’ learning experiences for staff — in the form of isolated staff meetings or off-site workshops. The programme must be a part of the ‘weave’ of everyday activity in your school/kura/centre, with regular opportunity to identify and celebrate the successes along the way as the change goals are achieved. If you are responsible for the design and development of professional development programmes in your school/centre, here are four research-based principles that should underpin your planning and decision-making. The change process will inevitably challenge existing beliefs and behaviours. The change won’t occur by simply sharing what the ‘new’ beliefs and behaviours must be. There must be opportunity for engaging deeply with the background rationale and evidence, and for in-depth discussion and debate. “Rome wasn’t built in a day” (or so the saying goes), and effective, lasting educational change doesn’t occur as a result of a single staff meeting or workshop. Sure, a single event may act as a catalyst for change, but for the change to be embedded and sustained the professional development must be sustained over a significant period of time to allow for iterations to occur and the new behaviours to ‘bed in’ and become the ‘new normal’. An iterative approach that builds on action research or cycles of inquiry provides opportunities for the refinement and ideas and approaches that eventually establish the changed culture and patterns of behaviour. Meaningful change cannot occur simply by borrowing ideas from elsewhere and assuming they’ll work the same in your context. Your staff, your students, and your community are different. There will be different needs and different opportunities and resources for you to tap into. Sure, an idea from somewhere else may serve to stimulate your thinking, but you need to do what will work for the learners in your context. Finally, there’s little point in any professional learning that isn’t linked to practice. Stories abound from the days where teachers periodically went off-site to attend PD sessions, most of which were aimed at providing ideas and experiences that may be useful ‘just in case’ the need emerged when the teacher went back to school. Nowadays, the focus needs to be on PD approaches that provide access to these new ideas and approaches ‘just in time’ — so that they can be implemented, trialed, reflected on, and refined in the context of the teacher’s own practice. Not only must the PD be linked to practice, but there must also then be evidence of the impact of this on that teacher’s practice. The approach outlined above places high expectations on the leadership in our schools/centres. The competing demands for the limited financial resources available in most schools/centres to support professional learning can create tensions that are difficult to resolve. Approaches that rely exclusively on externally designed and delivered PLD are no longer viable (or effective). The changes announced to PLD by the MoE aim to grow leadership capability across the system and strengthen profession-led support for curriculum, teaching, and learning. The momentum must come from within our schools, kura, and centres — but doesn’t exclude drawing on external expertise. Indeed, a further goal of the MoE changes to PLD is to mobilise quality assured internal and external expertise — drawing on the strategic wisdom and critical support of external providers where this is aligned with and adds value to the internally agreed goals and direction for the school, kura, or centre. As you contemplate the changes that lie ahead in 2016 in your school/centre, now is the time to review your vision, values, and action planning, and to ensure that a well-designed programme of professional development is a key part of this planning. For my first blog post of 2016 I thought it appropriate to feature a 'future focused' piece. As the parent of an 18 year old who is currently assessing his career options I was interested to read this morning a report from the World Economic Forum titled The Future of Jobs that has just been released. The report is premised on the idea that the world is currently in the midst of a Fourth Industrial Revolution, characterised by a fusion of technologies that is blurring the lines between the physical, digital, and biological spheres. The authors argue that this revolution is not simply an extension of the digital revolution that began in the middle of the last century. While it builds on the developments of this revolution, it is significantly different in three ways: 1. the speed of the development, 2. the scope of what is affected, and 3. the impact on systems change. Key drivers of change in this revolution are the emerging technology breakthroughs in fields such as artificial intelligence, robotics, the Internet of Things, autonomous vehicles, 3-D printing, nanotechnology, biotechnology, materials science, energy storage, and quantum computing. This interests me as an educator as I consider how these things are (or aren't) reflected in our curriculum – not as an argument for introducing these as defined areas of study necessarily, rather, how seriously we need to consider the development of understandings, skills and competentices that will enable our young people to participate fully in a world where these things are shaping the way we live and the jobs we do. This is not simply an argument for increasing the focus on technical skills – a far wider set of skills and competencies will be required to thrive in this 'fourth revolution'. On average, by 2020, more than a third of the desired core skill sets of most occupations will be comprised of skills that are not yet considered crucial to the job today, according to our respondents. Overall, social skills— such as persuasion, emotional intelligence and teaching others—will be in higher demand across industries than narrow technical skills, such as programming or equipment operation and control. In essence, technical skills will need to be supplemented with strong social and collaboration skills. This is not a new message – this thinking is exactly what informed and underpins the emphasis on key competency development in the New Zealand Curriculum! The perspective added by this report, nearly 15 years later, is the reinforcement of how important and urgent it is that we take our curriclum seriously, given the data revealed here about the shifts in job types and opportunities that are occurring. While I hear a lot of talk among some of my colleagues about 'slowing down' and 'getting the basics right', we owe it to our mokopuna and tamariki to ensure that the things we prioritise in the precious time they are in our care at school take into account the sorts of trends outlined in this World Economic Forum report. A key factor for educators and our education system is to consider how we might re-think our approaches in schools and tertiary insitutions, given that the exponential pace of change. During previous industrial revolutions, it often took decades to build the training systems and labour market institutions needed to develop major new skill sets on a large scale. Given the upcoming pace and scale of disruption brought about by the Fourth Industrial Revolution, however, this is simply not be an option.